Now, for the first time, you can combine the classic Detecto physician scale with the time-honored beauty and protection of stainless steel. 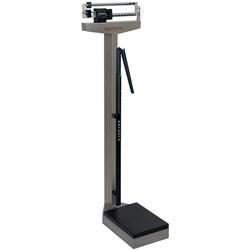 Enjoy the classic elegance of stainless steel in your Detecto mechanical weighbeam scale. A platform cover that lifts off easily combined with the stainless steel casing makes cleanup a breeze. Water damage from mopping and high humidity areas around swimming pools is a thing of the past with Detectos stainless steel health care scales. Scale height is 59” (1.5 m) and the die-cast beam can be easily read from either side.